Go the distance in comfort, without sacrificing that cruiser appeal. At the heart of the Cross Roads Classic LE sits the Freedom V-Twin power plant, expertly balanced for the perfectly controlled explosions that deliver 97 horsepower and 109 ft. lbs. of hole shot torque. Maestro of the motorcycle world, it’s what keeps man, machine and highway working together in perfect harmony. Standard on the Cross Roads Classic LE, the Victory Anti-Lock Brake System doesn’t discriminate between dry, wet or rock-strewn pavement. No matter what the conditions, ABS monitors what the wheel is doing and gives you consistent, smooth braking from the handlebar lever down to the rubber on the road. 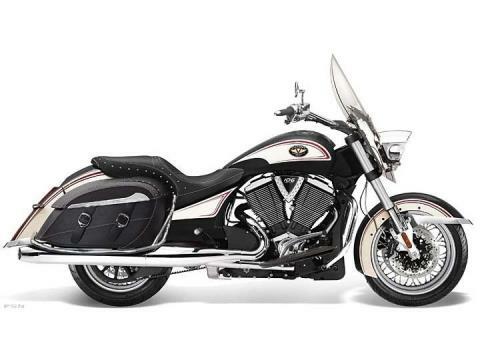 Enjoy 17.4 gallons of soft bag storage capacity standard on the Cross Roads Classic LE. This bike will sport the look of a well-groomed road warrior, and you’ll have plenty of cargo space for another rider’s carry on. The addition of chrome spoke wheels keeps the Cross Roads Classic LE running true to its old-school touring heritage, while providing the precision performance and stability that today’s open road calls for. Taking a cue from newly-striped blacktop, the Cross Roads Classic LE features white stitching on the black leather seat and saddlebags in order to promote its vintage look. While continuing to include all the advancements in modern day touring, the Cross Roads Classic LE remains loyal to the days when riders saw the world in black and white. Bowing to the robust heavy metal appeal of early motorcycling, the chrome fender bumpers on the Cross Roads Classic LE catch the eye as you come and go. Bracketing the bike front and rear, the chrome fender bumpers complete the marriage between modern-day touring and old-school design like no other machine on the road. The Cross Roads Classic LE brings the promise of “limited edition” home by testifying to its place in the Victory assembly line. With its number etched in metal and showcased in the sweet spot right between the cylinder heads, the Cross Roads Classic LE proves that it is truly one of a kind.